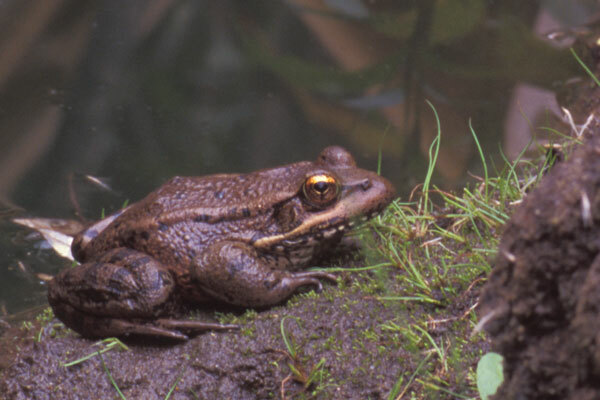 This species was until recently considered a subspecies of Rana aurora. Most published material still calls these frogs Rana aurora draytonii. 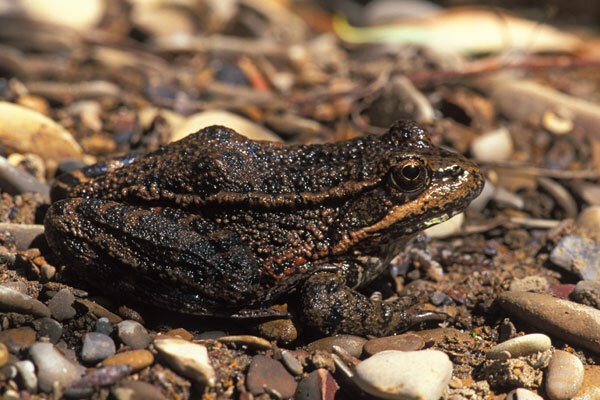 This threatened species has been pushed out of its habitat by development and by competition from the larger and more voracious bullfrog, originally an eastern U.S. species that was introduced to California as a source of frog legs for restaurants in the gold rush days. 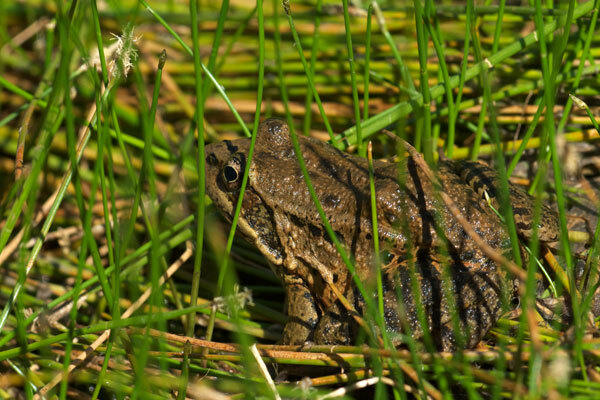 It's generally believed that the frogs in Mark Twain's famous story "The Celebrated Jumping Frog of Calaveras County" was a California Red-legged Frog. This large healthy adult was posing for me in an unusual position -- on the shore, but facing away from the water. However, when I tried to get closer for another shot, it turned completely around and jumped into the water in a single motion, so I guess it knew what it was doing. Another large healthy adult sitting on a shore, presumably waiting for tasty treats to crawl its way. Dan Singer pointed this one out to me; we ran into each other at Año Nuevo State Park both searching (unsuccesfully this time) for San Francisco Gartersnakes. I had stopped at a small beach access area along Pacific Coast Highway to let my dogs stretch their legs. 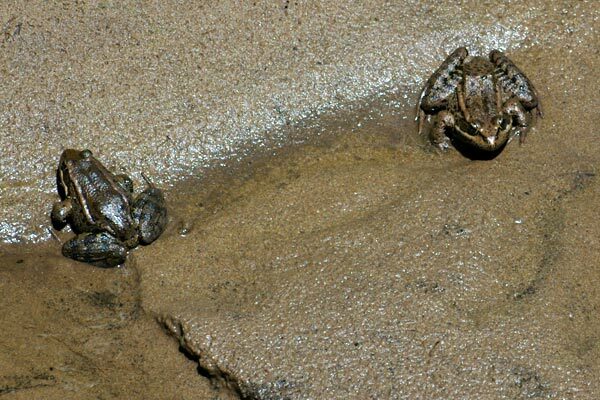 Climbing down a narrow wooden staircase from the road to the beach, I noticed these two fat adult California Red-legged Frogs hanging out near a small pond in a creek drainage. 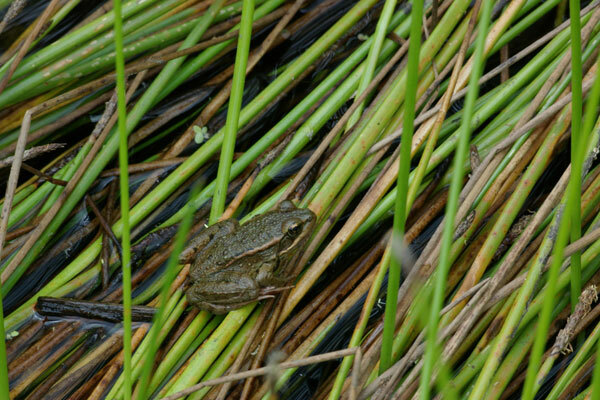 I found this content-looking frog in the same little nook at Pescadero Marsh where I've consistently seen California Red-legged Frogs over the years. This was quite a large individual, possibly the biggest I've seen yet. 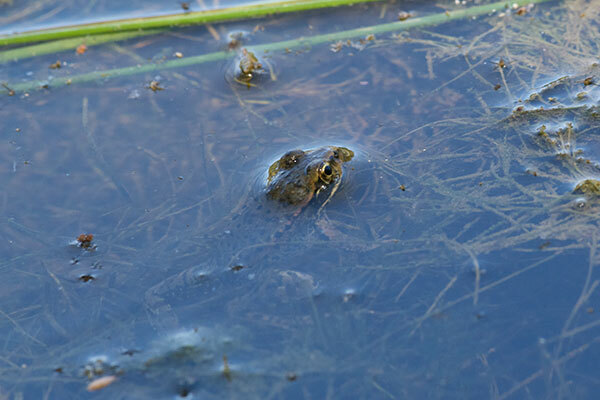 I've seen a good number of California red-legged frogs, but for some reason I usually see full-sized adults. This is the first time I've been able to photograph a young one; this one was less than two inches long. My friend Fred Harer noticed this little guy while he and his wife Angie and I were spending an afternoon primarily looking for San Francisco gartersnakes to photograph. 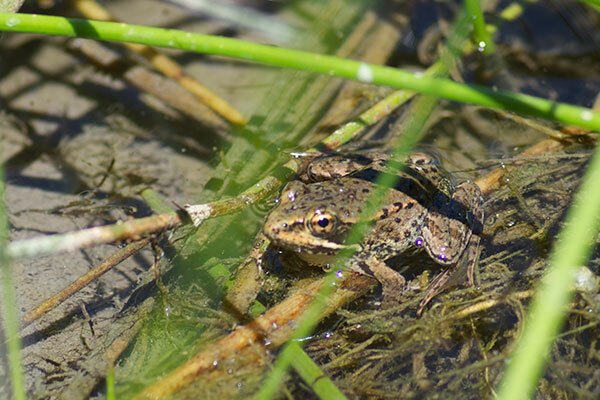 Bear Gulch Reservoir's population of Rana draytonii was extirpated in the early 1980's, probably due to an infestation of non-native catfish. The catfish had originally been released into the reservoir by someone who wanted to fish for them, and had thrived there, to the detriment of the native species. To return the ecosystem to some semblance of its natural balance, the park staff drained the reservoir in 1985 and removed all 1700 pounds of catfish. 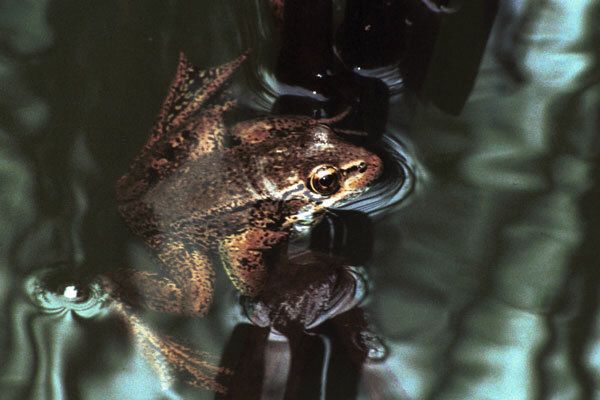 In 2001 the park staff started reintroducing red-legged frogs to the reservoir by transporting egg masses from nearby streams to the reservoir. 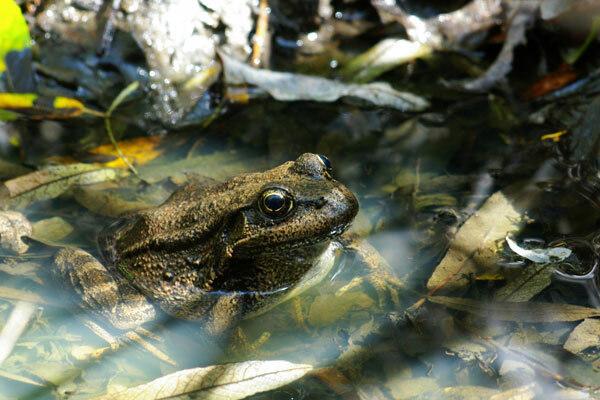 Now there seems to be a healthy population of these large frogs enjoying the good life in the reservoir; we saw quite a few of them around the reservoir. There's a more detailed version of this reintroduction story on the National Park Service site for this park. 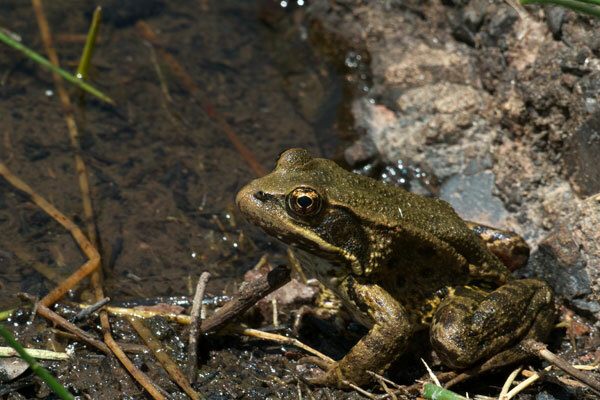 Since earlier in the day I had seen bullfrogs in a stream at this park, I was happy to find a pond that had this native big frog species instead.